Beware! Caution! Warning! These are just a few of the wicked things we have heard about brick-and-mortar retail over the last couple of years, but it’s just a bunch of hocus-pocus. This month, it seems something else is brewing in the industry: optimism. According to a recent survey conducted by the National Retail Federation, Halloween spending is projected to hit $9 billion this year! That’s the second highest in the survey’s 14-year history, just missing last year’s record $9.1 billion in sales. More than 175 million Americans are planning to participate in Halloween festivities, each spending an average of $87, also up from last year. Despite the myths that still haunt the retail industry, the truth is that overall retail is thriving. Thanks to a robust economy, retail sales have increased year over year since 2015—forecasters are expecting a 4.5% growth for 2018. Consumer sentiment is high, with the index topping 100 for only the third time since January 2004. Fact-based analysis shows that consumers are still spending; they are merely spending differently. 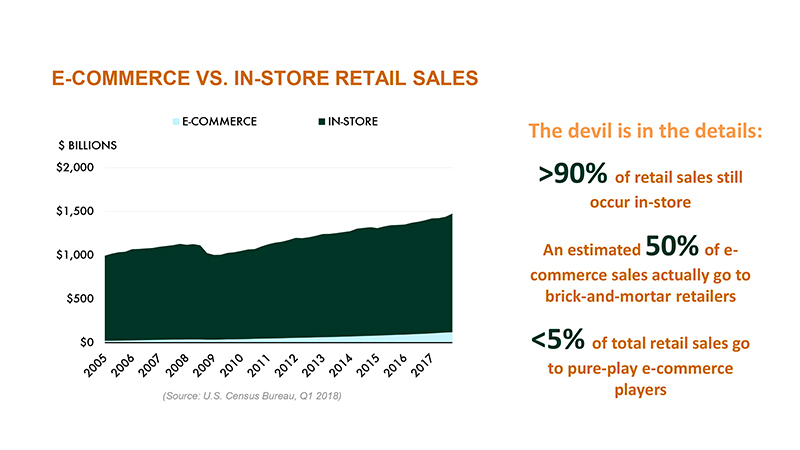 We’ve heard the horror story of the bloody battle between physical stores and e-commerce, but it’s not what it appears to be. In fact, e-commerce still only accounts for less than 10% of total retail sales. Furthermore, over half of those online sales are actually generated by brick-and-mortar retailers! Many brick-and-mortar retailers are spending billions of dollars on their online platforms and supply chain networks. It’s the brick-and-mortar retailers driving the e-commerce. It might sound batty, but research shows 78% of consumers prefer to shop in-store and spend significantly more in physical stores than online. On top of that, e-commerce is expensive. With the high cost of delivery and even higher cost of returns, it is virtually impossible to make a profit through pure online tactics. Successful retailers are maximizing sales by leveraging both brick-and-mortar and online strategies. Looking a bit down the road, a new holiday forecast offers even more good news. Retailers are poised to rack up their best sales in years this season. Holiday sales between November and January are estimated to grow 5% to 5.6% from last year to more than $1.1 trillion, up from the $1.05 trillion last year, according to Deloitte’s annual holiday retail sales forecast. So have no fear, the death of retail is NOT near. However, with all of the retail tales of terror, it can be confusing and overwhelming, especially for commercial real estate investors and property owners. Evolution in the commercial real estate industry is creating rapid change. This new landscape is impacting real estate values—presenting both problems and opportunities in the market—and increasing the need for professional real estate guidance for investors and property owners. That is why Stirling Properties recently formed a new Investment Advisors division that specializes in acquisitions, dispositions, and investment sales of retail assets and other property types. Stirling Properties’ Investment Advisors division has the depth and breadth of experience to help solve problems and maximize the potential of commercial investment assets. Our team can help to assess the risk and rewards of any asset or investment and guide clients through difficult decisions. Stirling Properties’ Investment Advisors represent a wide range of client types, including private owners, institutional investors, and private equity firms. 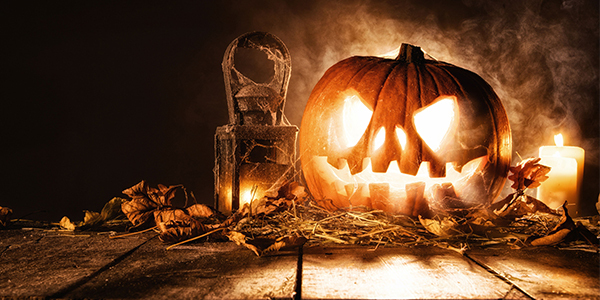 October is full of enough frightening experiences, your real estate portfolio doesn’t have to be one of them. If you are unsure how to navigate the complexities of the retail industry or other commercial sectors or are interested in exploring commercial asset opportunities, let our investment advisors help you sort through the cobwebs. Contact one of our experienced agents today. On behalf of Stirling Properties, we witch you a Happy Halloween!